UFO or URO? We all know that people claim to see unidentified flying objects but what you are experiencing in this podcast are mostly unidentified recorded objects. Over the last few months I’ve attempted to recover quite a number of the ever-degrading reels in my possession and in doing so have fallen down a rabbit hole of ever increasing high-strangeness. The episode was almost completely unlistenable but I did indeed figure out what it was, and in doing so, was able to track down a version which was palatable for the ear. So , to kick us back into the swing of things it is presented here for your continued enjoyment. It is becoming clearer than many of these tapes have a commonality and that it has something to do with either cults, mind-control or both. The next episode will now be so easy to listen to. The quality of the upcoming recordings are difficult to understand and in many instances, frightening. You’ve been warned. As the reels crumble in my hands I am finally rewarded with a bit of ease and relaxation. 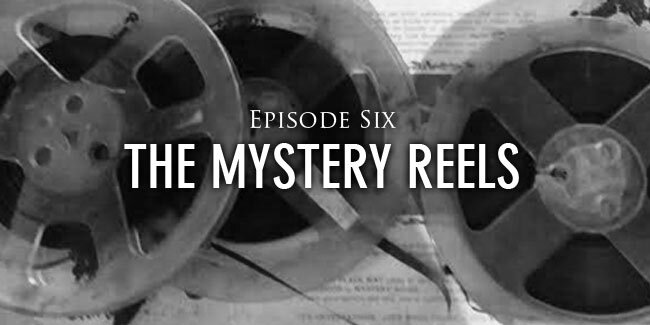 I found a reel labeled “UFO 1952” and so the quest began. After digitizing the 64 year-old recording I found it to be almost unlistenable and yet I had clues! 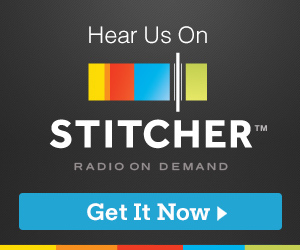 I scoured my files and the internet to track down the mysterious recording and it was indeed an old time radio show. 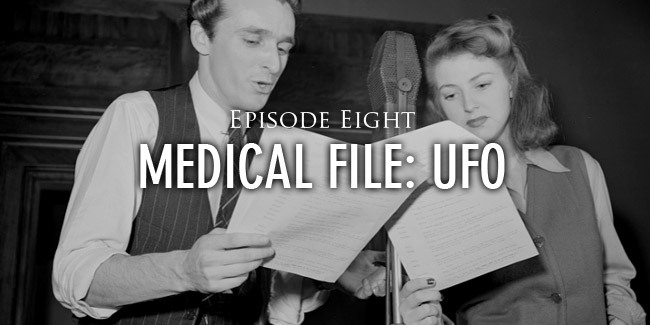 Medical File was a radio show from the 1950’s and most of the episodes deal with murders and illnesses, yet one episode…this episode dealt with the phenomena of unidentified Flying Objects. The internet gods saw how I did not want to spend countless hours restoring my ancient recording so thankfully I was able to track down a great version for your ear-holes. 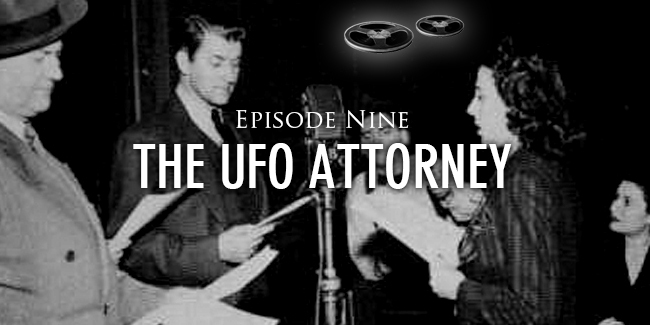 So here for your enjoyment is the full, restored episode of Medical File: UFO. 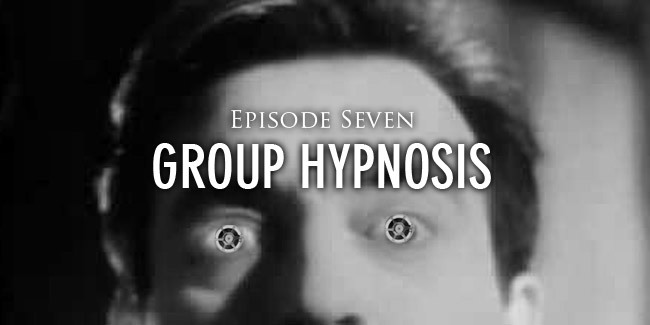 Did I fall victim to hypnosis? No, but the person on the reel in this episode did. I know it’s been a few months since the last episode so for that, I apologize. 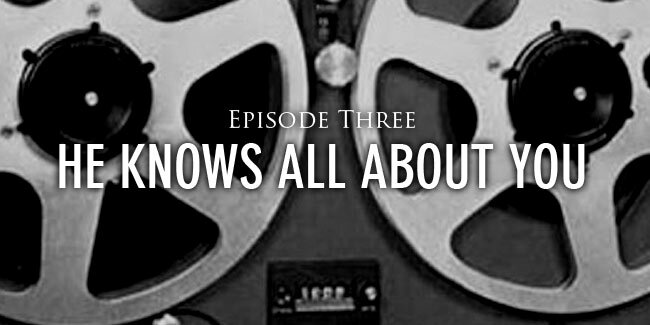 You’ll hear in this episode a brief little “hello” but more than anything I just wanted to get this episode out so the ball can start rolling again. 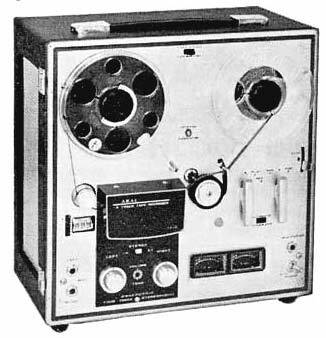 You’ll also hear a tiny bit about the technical difficulties which are sure to happen when dealing with 50-year-old reels and the vintage machines that play them. I’m not too sure what is happening on the tape in this episode, as usual, but it did remind me of one of my favorite classic movies The Clairvoyant, (The Evil Mind), from 1934. I will not fault you for not listening to the entire reel as the quality is very poor but feel free to skip into the last few minutes to hear what I find to be fairly disturbing. This is one of those times when you’ll really understand that I have no idea what is on these tapes. 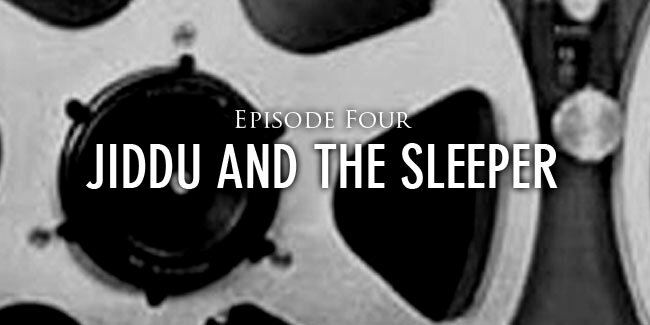 This episode seems to be either a hypnotic induction or a subliminal recording made to listen to while sleeping. Let me also say, it gets extremely creepy in my house at three in the morning, sitting alone listening to these recordings. Perhaps somewhere later down the road other upcoming tapes will reveal more information about this reel but until then we are left with only a very strange and not at all soothing voice alone, in the dark, repeating curious phrases, once lost and now found. He knows all about you. He is going to help you. He knows what to do and how to do it. He is your companion, teacher and friend. It is natural for you to have faith in He. He has power to help you. Watch and see what he does. He has the power to turn off your thinking. When you grab a random, unlabeled, reel-to-reel tape out of a box you never know what you’re going to get. 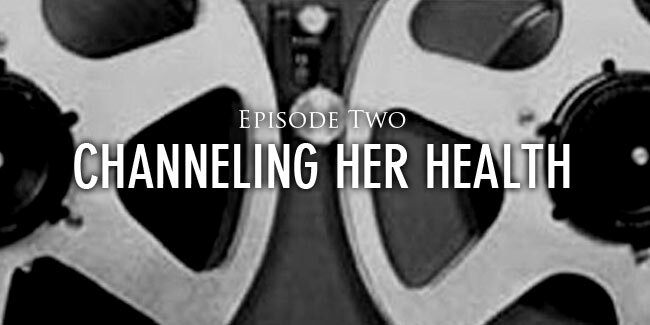 Strangely enough this episode features a channeling session for Virginia Welch, the wife of Owen Welch, who was the subject of our first episode. 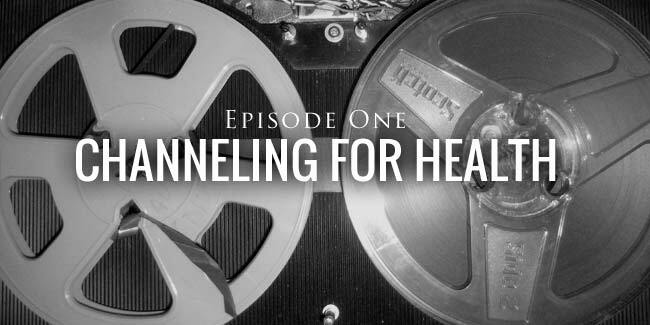 This recording was made four years after Owen’s session and focuses on Virginia’s health concerns; as well as questions about how to deal spiritually with herself and other people. We are once again unsure as to who the actual channel is from this session though it is obviously the same person who channeled for Owen. The question of whether it be Hugh Lynn Cayce from A.R.E. or Ray Stanford from A.U.M. is confounded by information revealed during the session. The conductor, Barbara, (the person who asks questions of the channel) reads from Virginia’s letter in which Virginia speaks of “The Source.” This is the name Ray Sanford gave to his entity which he said he channeled. This idea is flummoxed by a mention earlier in the recording when the channel gives instructions to contact the Association of Research and Enlightenment, which was Edgar Cayce’s foundation. Also, the location of the channel is given as Phoenix, Arizonia which was a location of an A.R.E. chapter. The mystery of the channel continues. 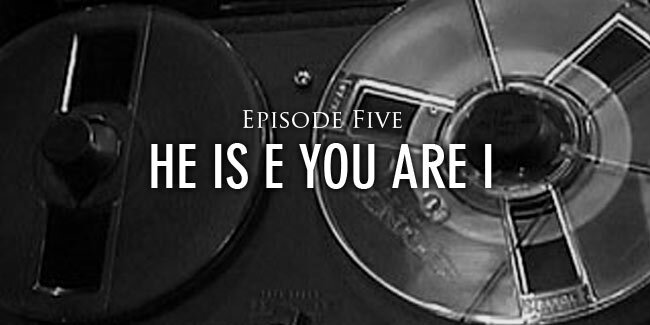 On this premiere episode we listen to a channeling session requested by Owen Welsh in 1962. Owen was a chiropractor, Rosicrucian and homeopathic health devotee. Throughout his life he would request channeling session from various psychics and mediums. It is quite possible that the channel heard in this recording is Hugh Lynn Cayce, the son of well-known psychic Edgar Cayce. Owen Welsh, being a member of A.R.E. (Association for Research and Enlightenment, founded in 1931 by Edgar Cayce) did at the time exchange correspondence with H.L. Cayce and some recordings were known to have been made. Another possibility is that the channel in this recording is a man named Ray Stanford. In the early 1950’s Stanford began by receiving messages from “space people.” Some years later Stanford created The Association for the Understanding of Man (AUM) wherein Stanford would channel messages from what he called “The Source.” Mr. Welch, and his wife, were also members of this organization. This episode contains the full channeled session as sent to Mr. Welsh. Topics include: Past-Lives, methods for curing ailments and Karma.